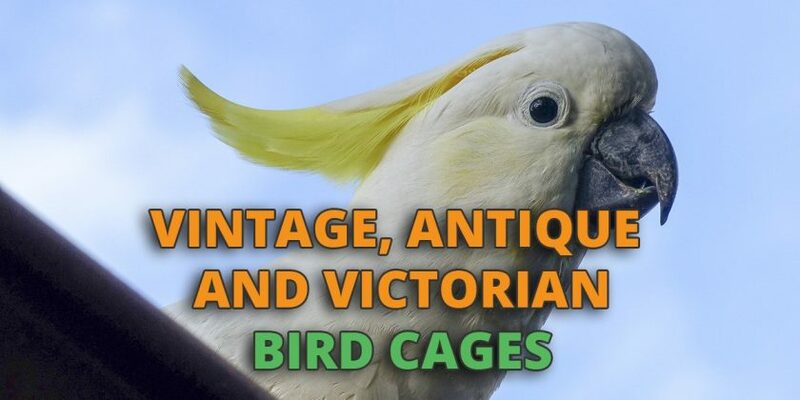 The addition of an antique or Victorian style bird cage can lend some character and individuality to the room or area where you keep your pet bird. As pet bird owners, we should be putting the bird’s needs before ours when it comes to the various aspects of its care. The choice of the style of your bird cage is one area where you can look to satisfy your own desires without negatively affecting your pet. Your bird won’t care how the cage looks as long as it is big enough for the species you are keeping. Is A Victorian Style Cage Right For Me? Humans have been fascinated by birds since the first time they saw one fly. The practice of keeping birds, and housing them in cages, goes back thousands of years. According to Jerry Dennis writing in the Michigan Quarterly Review, the Sumerians, who are the oldest civilian to have kept written records, had a word for birdcage. Mention of captives birds speaking in human voices appears in Persian writings as far back as the fifth century BC. Alexander the Great introduced the ringneck from India to Europe in the 4th century BC. When the western hemisphere was discovered it did not take long for native species such as macaws to make their way back to Europe. Birds have been kept for their beauty and companionship, as well as for utilitarian reasons such as using canaries as air quality monitors in mining operations. A common denominator in all instances of humans keeping birds is the need for a cage to display the animal and prevent it from taking flight and escaping. The earliest bird cages were net enclosures and boxes constructed from wood, rope, reeds, and bamboo according to petcha.com. The practice of keeping birds has gone through various stages of popularity. In the 17th and 18th centuries there was a renewed interest in keeping birds, especially in the upper classes of society. They were considered entertainment and could be moved from room to room to provide a pleasant sound. 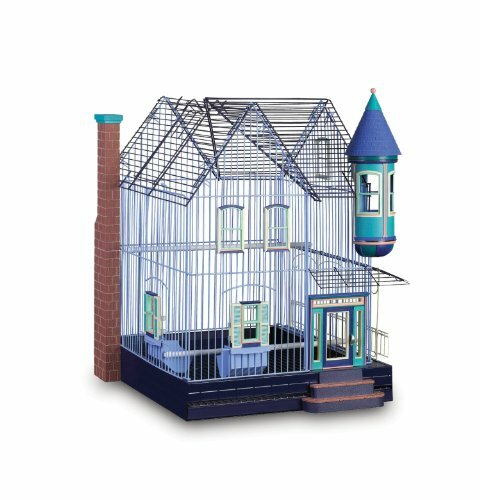 Cages began to be made in a more ornate style to complement the furnishings of the members of high society that kept birds. In many cases, the cage was almost strictly decorative, with the needs of its inhabitant relegated to an afterthought. They often appeared as miniature versions of human architectural dwellings. Below is a video that shows an example of a bird cage that resembles a palace. The Victorian Era brings to mind the mid to late 1800s, particularly as it pertains to Great Britain. Bird cages constructed at this time were elaborately decorative and were often used simply as decorations without being used to house birds. Visually, these cages give the impression of the general Victorian style of architecture, with spires and gables. A distinguishing feature of many Victorian style bird cages was the ability to hang the cage on a stand or from the ceiling. This made it easy to move the bird from room to room. The cages could be round or square, but in either case, were not designed with the bird’s best interests in mind. We now know that birds appreciate being next to a wall or solid surface so they feel safe when perching and relaxing. Round cages hung away from a wall will make for an anxious bird. A drawback to actual antique cages is that they were constructed before we knew the dangers of certain metals to both humans and birds. True antique cages should only be used for their decorative quality and not to house birds. According to petplace.com, lead and other materials used in their construction can prove deadly to your avian companions. Nowadays, it is best to buy a modern cage that is designed to look like an antique or victorian bird cage but doesn’t have it’s drawbacks. 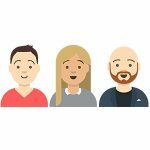 Pet bird owners who would like to add a distinctive visual style will want to take a look at some of the below options that are available to you. This is an ornate cage inspired by Victorian era architecture. It features delicate scrollwork and a decorative finial top. Its dimensions are 18Lx18Wx25H inches (45.7×45.7×63.5 cm) with 5/8 inch (1.58 cm) bar spacing, making it a nice size for a pair of parakeets or a single bird around the size of a cockatiel. It features a bottom grill to keep your birds off of the cage bottom and an easy slide out drawer for cleaning. Two hooded plastic feeding cups, as well as two plastic perches, are included. 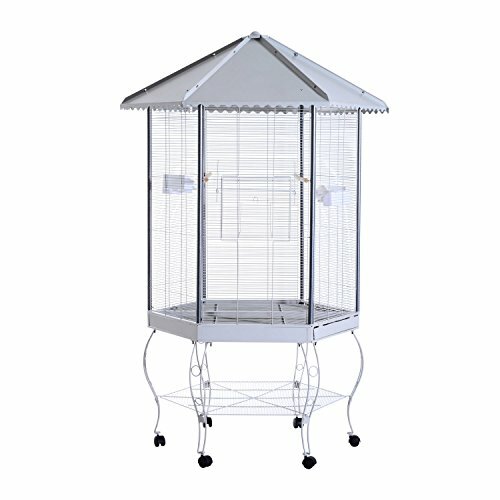 Nice, decorative style cage for your small to medium-size bird. This cage replicates a home built in the American Victorian style, with imitation windows and fireplace. Its dimensions are 18Lx18Wx25H inches (45.7×45.7×63.5 cm) with 5/8 inch (1.58 cm) bar spacing, making it suitable for small to medium-sized birds. There are two access doors, one on the front of the cage and one on top. Two plastic perches and food cups are included with the cage, and it has a removable grill and pull-out drawer for easy cleaning. Good, decorative cage for small birds. Children will love the look of the cage. This cage has a roof that is reminiscent of Victorian architecture. Its six-sided design affords you plenty of opportunities to hang toys and perches for its inhabitants. The cage has a 34-inch diameter ( 86.4 cm) and is 44 ( 111.8 cm) inches high and features 1/2 inch (1.27 cm) bar spacing. The cage comes attached to a stand giving it an overall height of 79 inches ( 200.1 cm). The stand has a shelf for storage and 6 casters for easy movement. It includes 4 feed boxes and two wooden perches, and there are two slide-out trays to facilitate cleaning. A very roomy cage that will work well for a group of small birds or a pair of medium-sized birds. 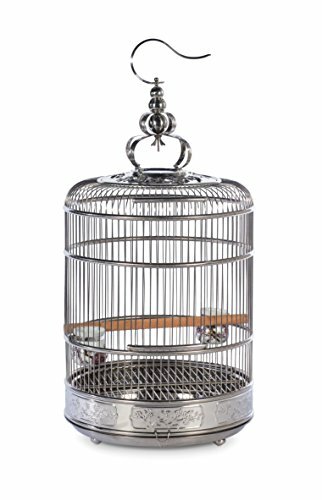 This stainless steel, ornamental cage has some unique features such as a foot-friendly carved perch and two porcelain water/feeding cups. It has a removable grill and that can be left in place when removing the bottom for cleaning. The cage is 14 (35.5 cm) inches in diameter and 19 (48.3 cm) inches high, with 1/2 inch (1.27 cm) bar spacing. Height to the top of the finial is 28 1/5 inches (72.4 cm). This distinctive cage can also be used as a planter or for other, strictly decorative purposes. A nice cage for displaying small birds. Perhaps best not used as their main cage due to the round design which can frustrate birds. This cage and stand are sized right for birds the size of cockatiels and conures. It features a drop-down front porch and an open top that holds a perch. The roof design gives you plenty of places to hang toys, and the top is a great way to let your birds out to play. Cage dimensions are 22Lx17Wx55H inches (55.9x 43.1×139.7 cm) with 1/2 inch (1.27 cm) bar spacing. Accessories include 3 stainless steel feeding cups and two wooden perches. The cart has wheels and a storage shelf, and the cage has a removable bottom grate and cleaning tray. A great cage for small parrots with lots of room and places for toys. 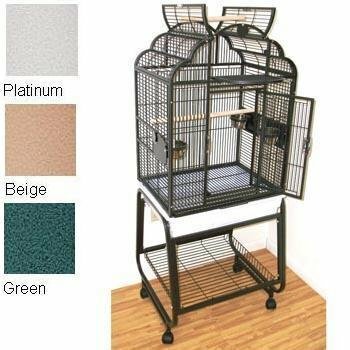 This cage offers a roomy home to medium-size birds with dimensions of 20Lx20Wx57H inches (50.8×50.8×144.8 cm) and bar spacing if 1/2 inch (1.27 cm). The cage can be removed from the stand, which has 4 wheels for easy movement. 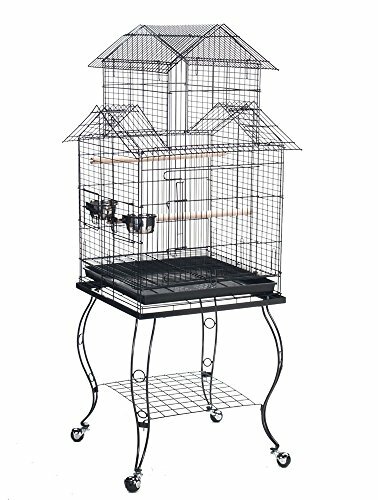 A large swing out front door and two feeder doors give you access to the cage, and two stainless steel cups and two wooden perches are included in the package. Removable bottom grate and tray make cleaning the cage an easy task. Makes a nice, distinctive looking cage for the right size birds. 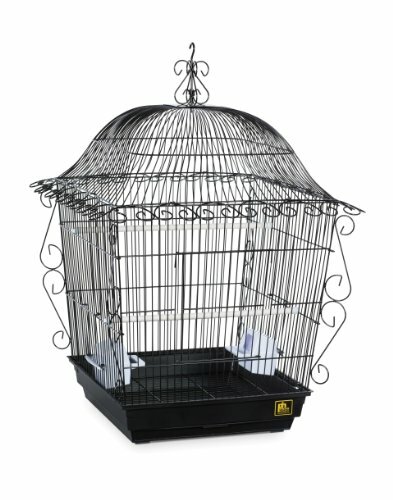 If you want more than just a rectangular cage for your pet bird, then you should look into Victorian style bird cages. You can add a decorative touch to your home while still giving your feathered friends an enclosure that takes their needs into consideration.